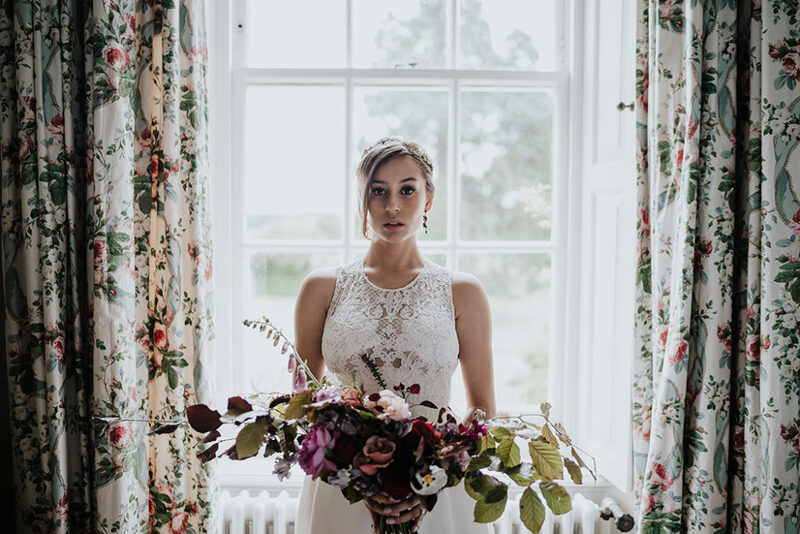 Images by New Forest Studio. 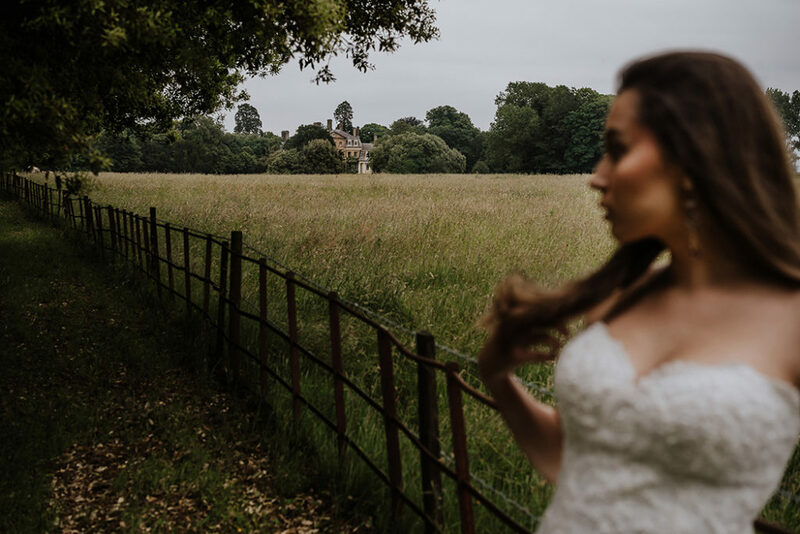 Oh hello Pylewell Park in Hampshire! 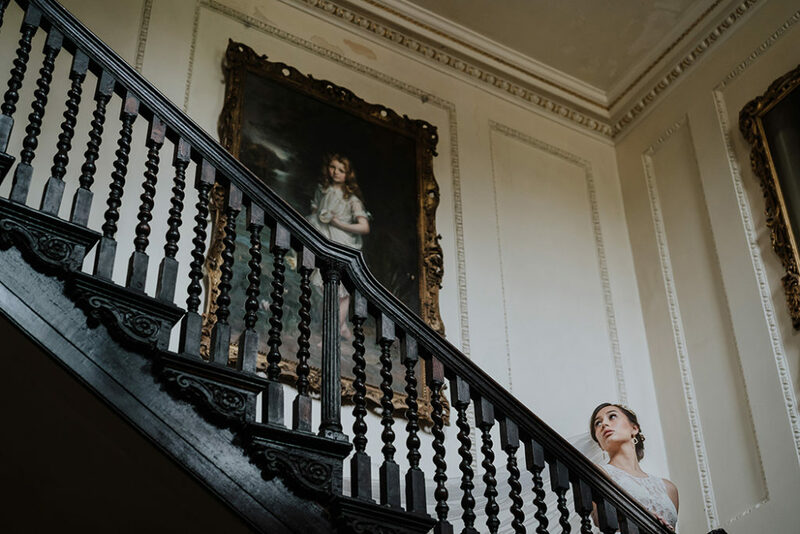 This recently launched country house venue is home to the Hon David and Melanie Roper-Curzon and entrenched in history showcasing grand glamour and shabby romance in abundance. 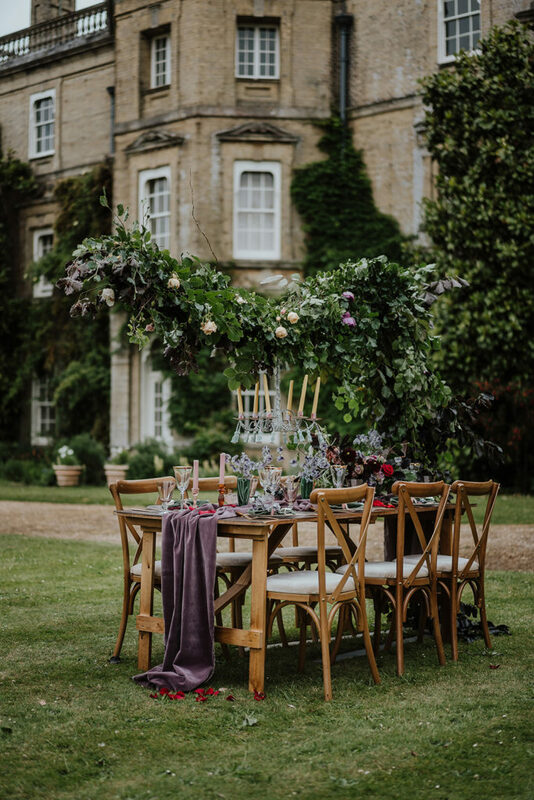 Pylewell has the luxury of complete exclusivity set on a 1,500 acre estate with 27 acres of rambling house gardens, a 15 acre lake and a private beach. 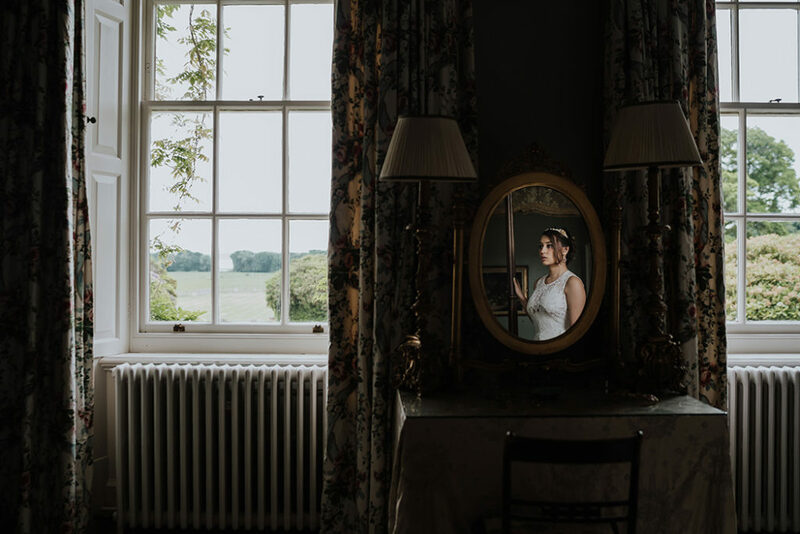 Located in the coastal town of Lymington, with a rich maritime history, the estate showcases panoramic views of the Solent as well as the natural beauty of the New Forest. 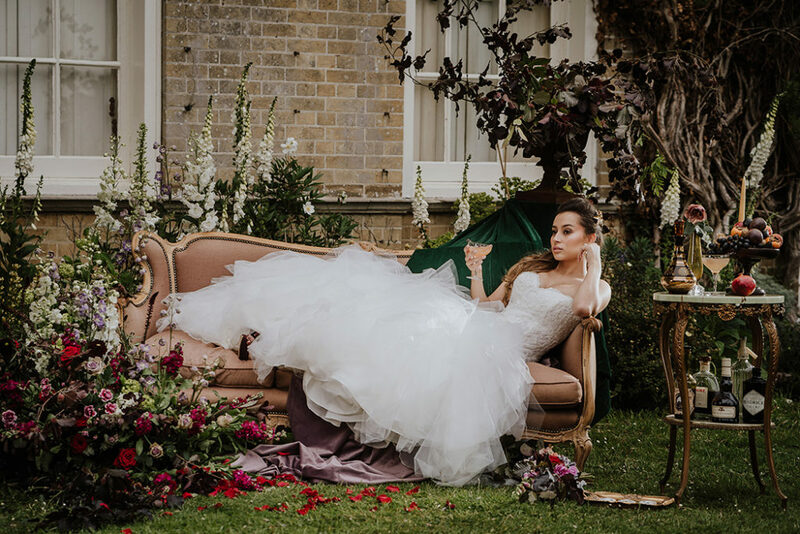 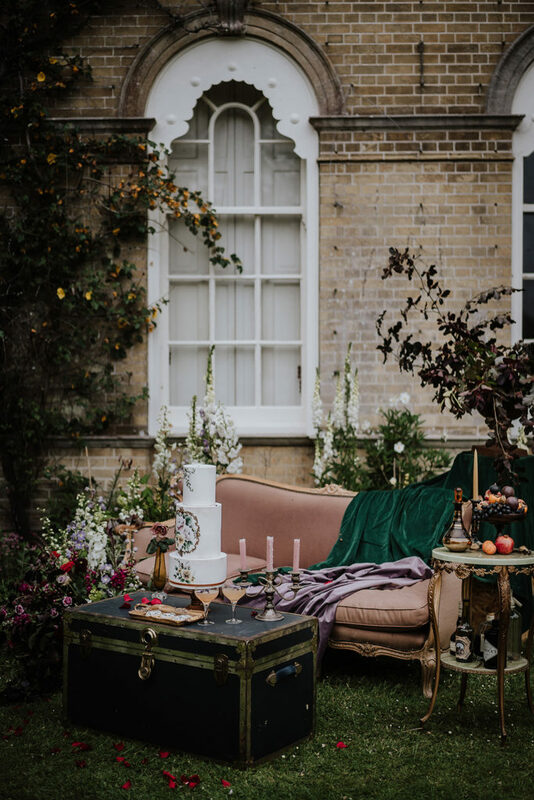 This scene inspired photographer Sam Alexander-Pearce of New forest studio, to collaborate with local Hampshire suppliers to create something rather special for this editorial shoot reflecting the unique location of this one of a kind venue. 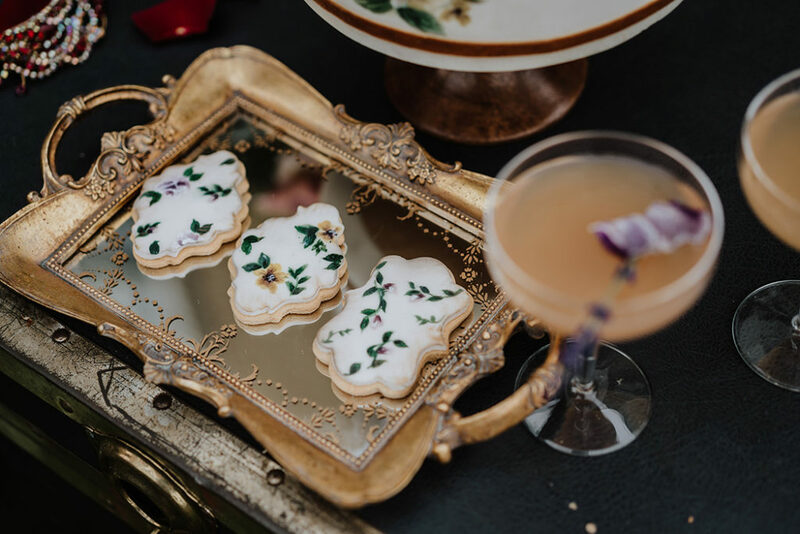 Keep scrolling to see all the deliciousness but if you still want more then check out Pylewell Park here where we went behind-the-scenes at their launch party last year. 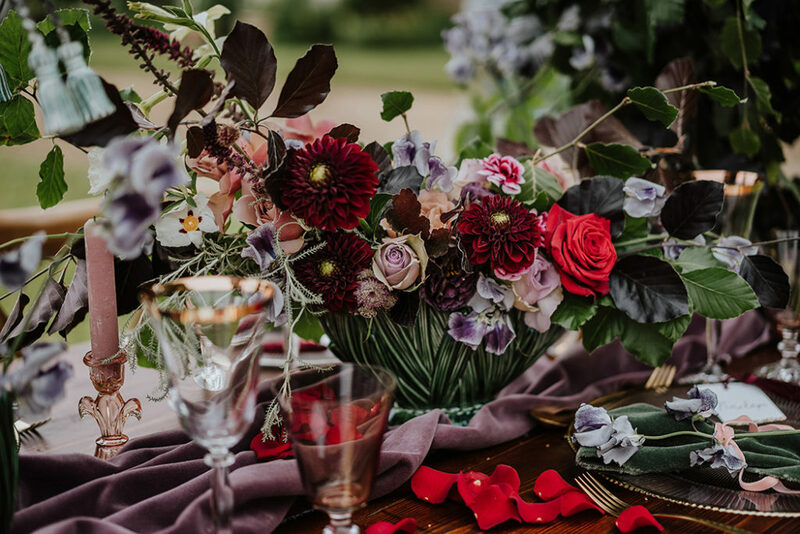 An eclectic medley of texture and colour was used to mirror not only the interior of this free-spirited venue but also the surroundings. 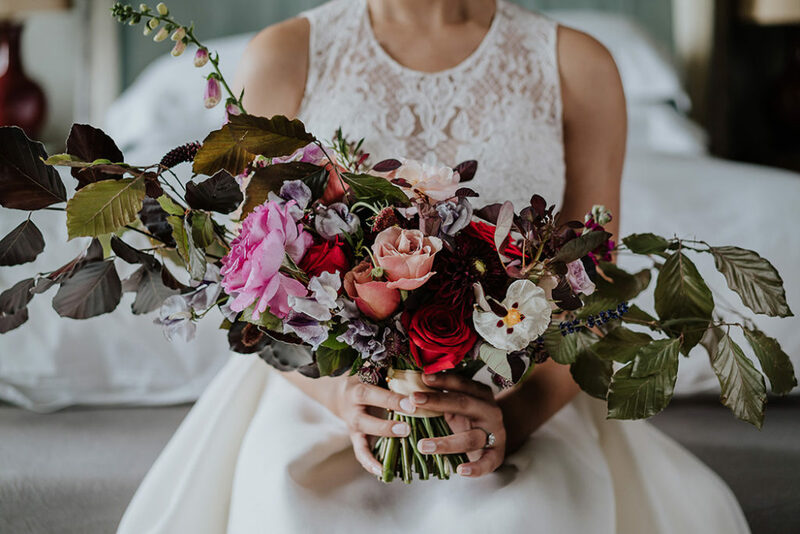 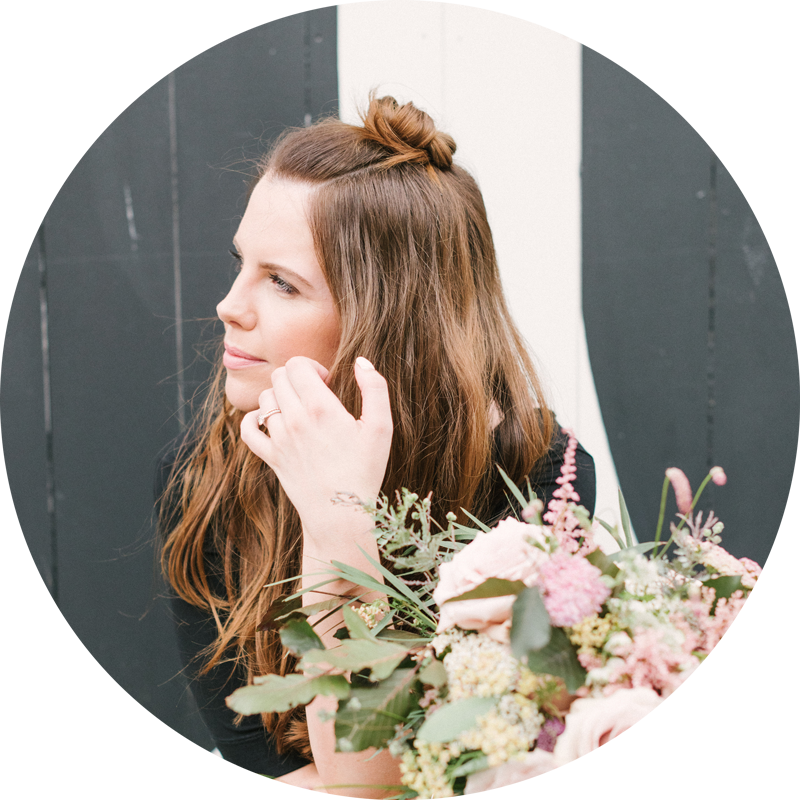 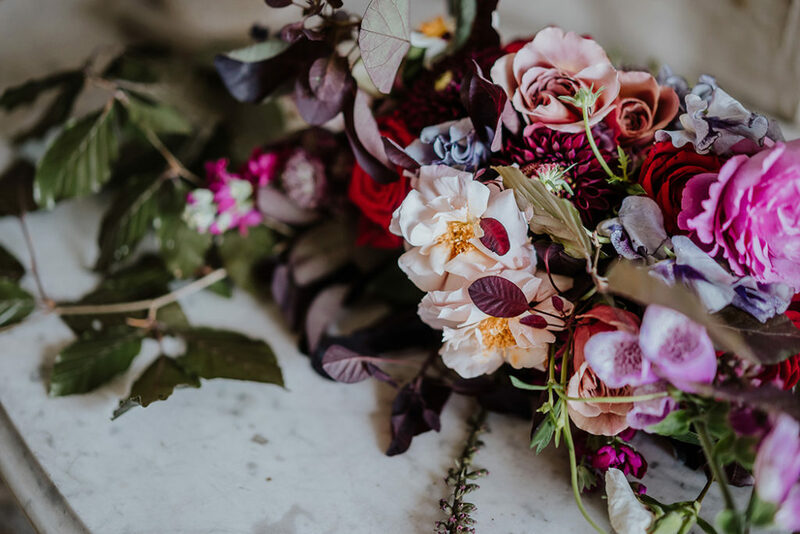 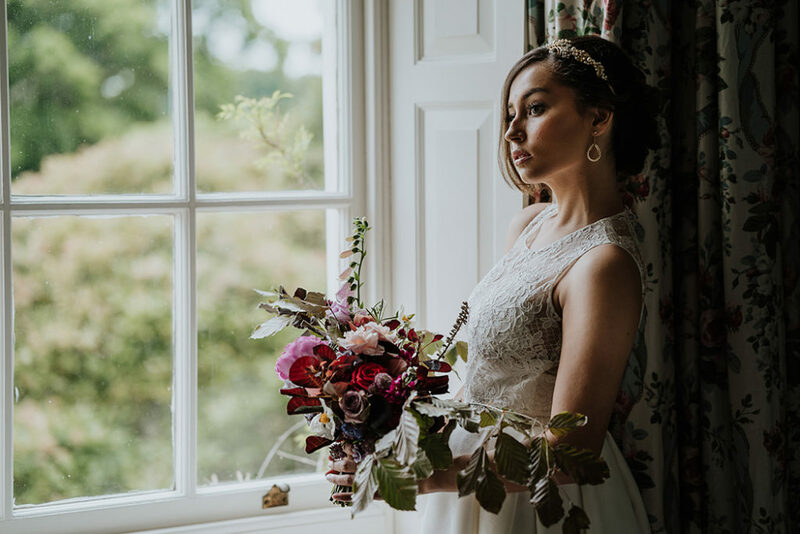 Free flowering British grown florals with added foraged elements from the grounds tied the luxe look together with perfect harmony. 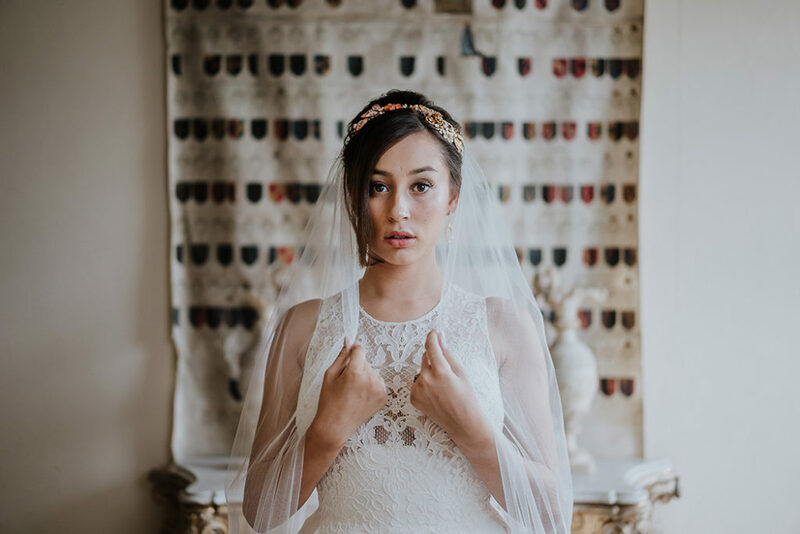 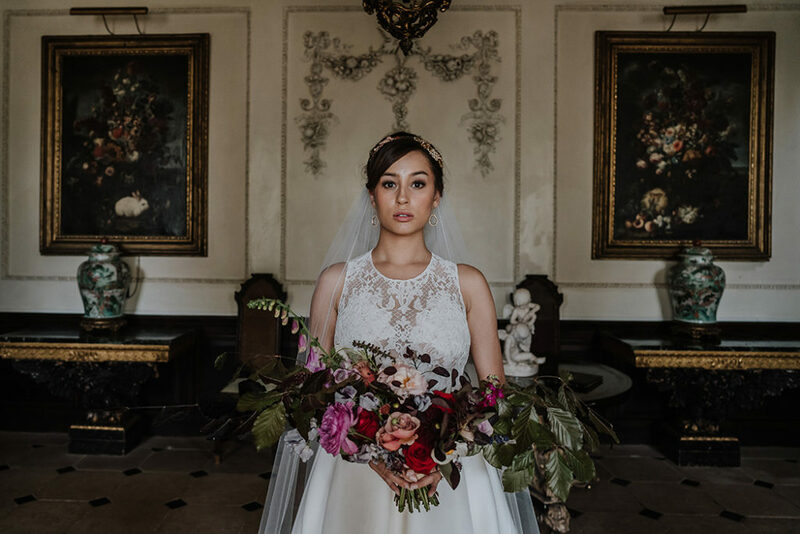 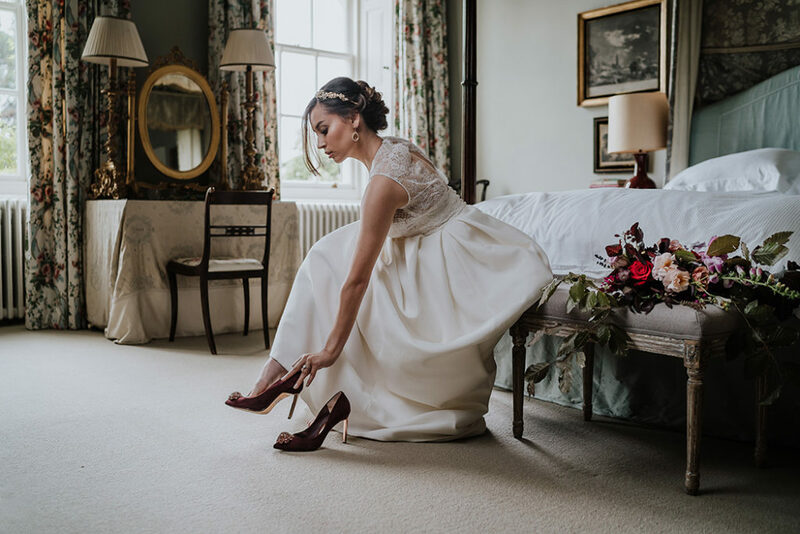 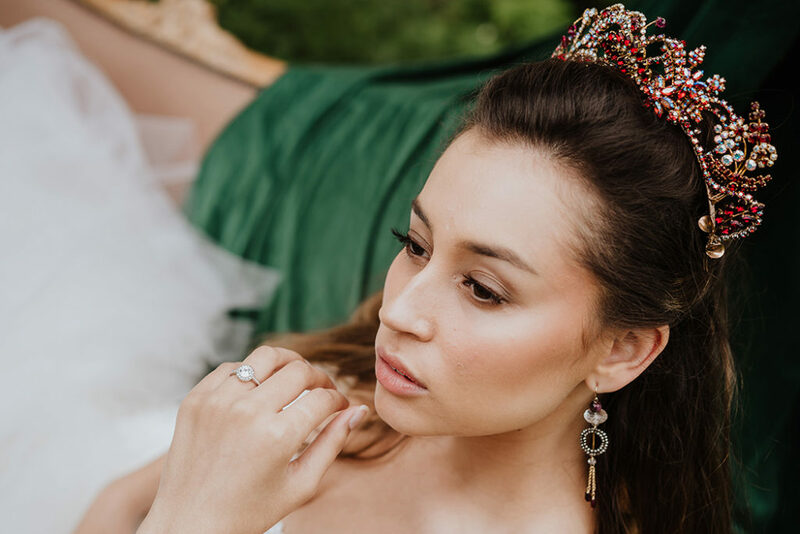 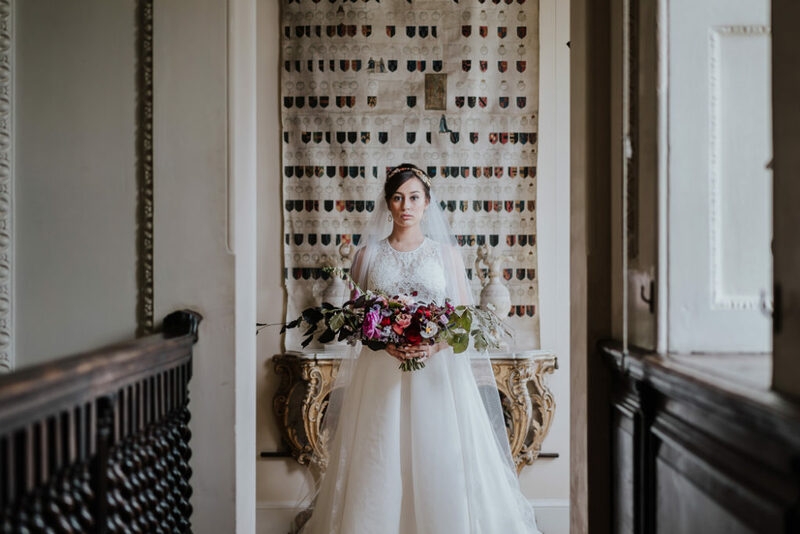 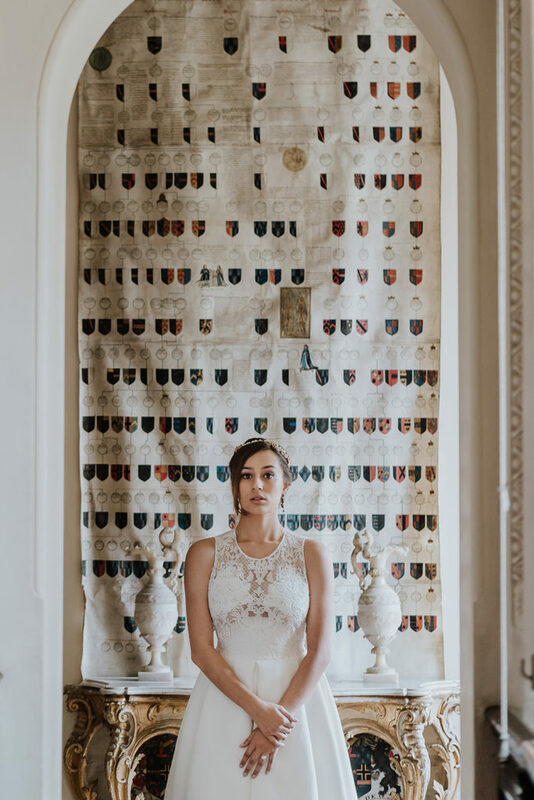 We wanted this editorial shoot to explore and embrace all the elements of this inspirational Hampshire wedding venue, the lines of symmetry and moody magnificence of each room is echoed with bespoke styling, from the stationery through to the jewels adorning the bride’s hair. 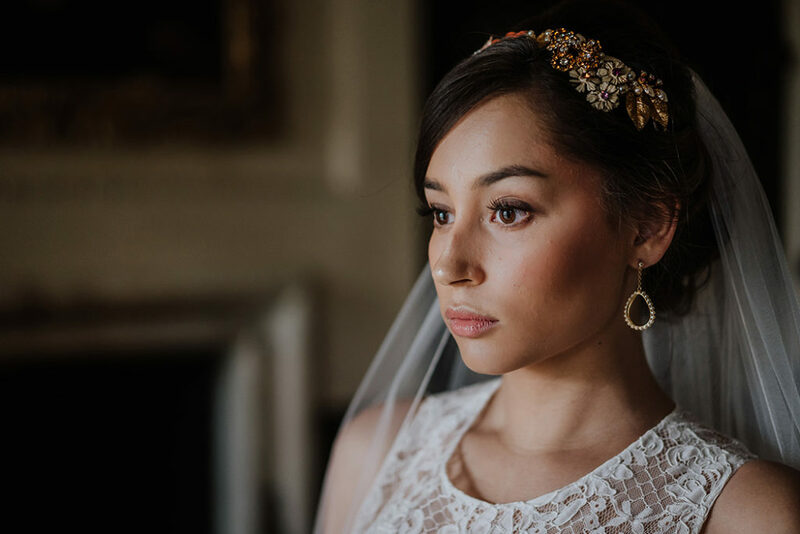 A modern, romantic yet elegant hair and make up design picked out the grace of Jesus Peiro and Justin Alexander gowns. 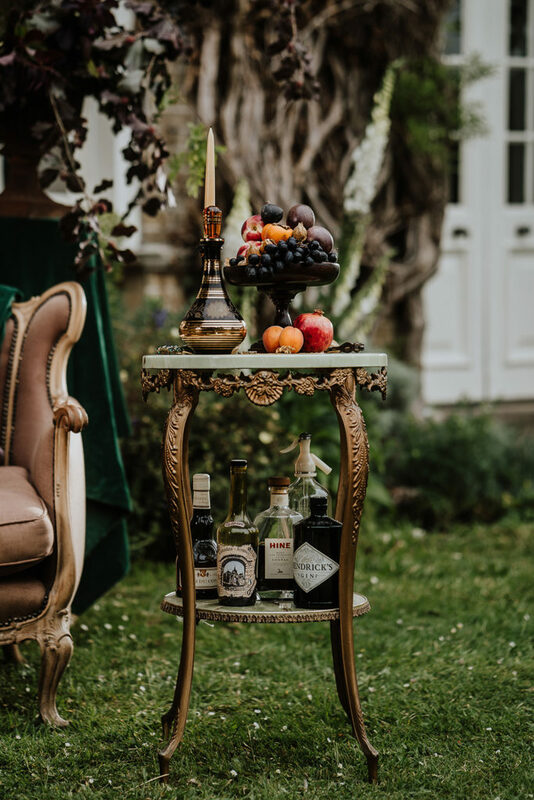 Take a step outside where a laidback feel was created but with a touch of fun; vintage glassware on a good old-fashioned drinks trolley showing off some off the classics; French 74, Bee’s knees and Old Fashioned for a jolly good knees up! 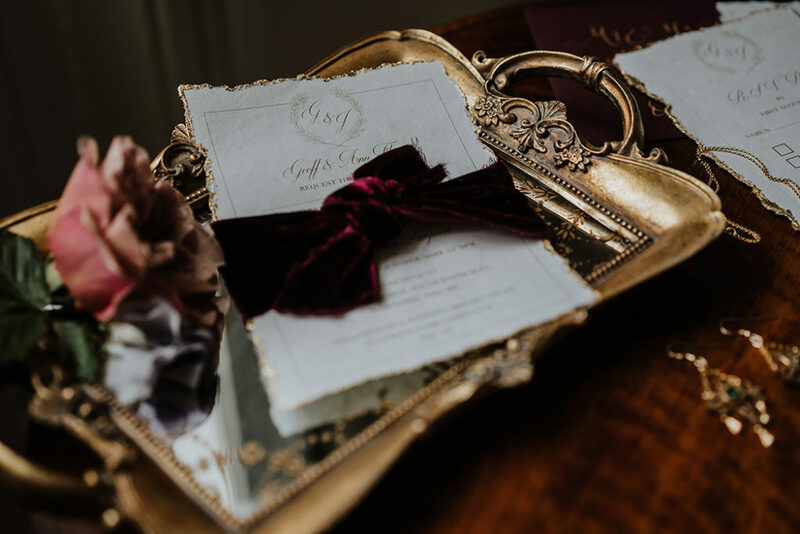 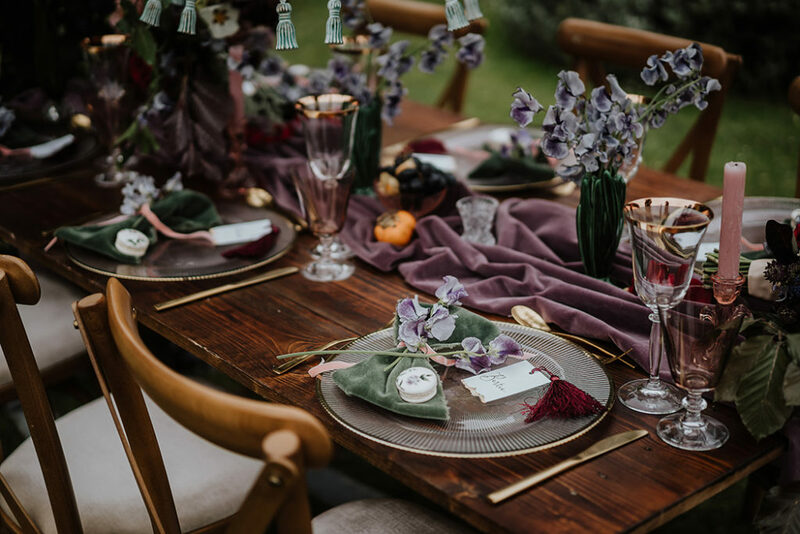 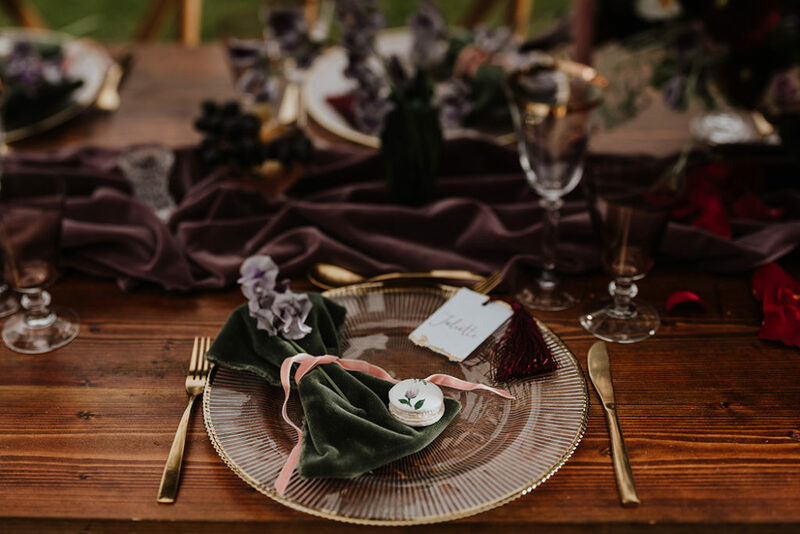 Sumptuously mixed tones and textures with hints of vintage gold luxe was featured within the top table shoot. 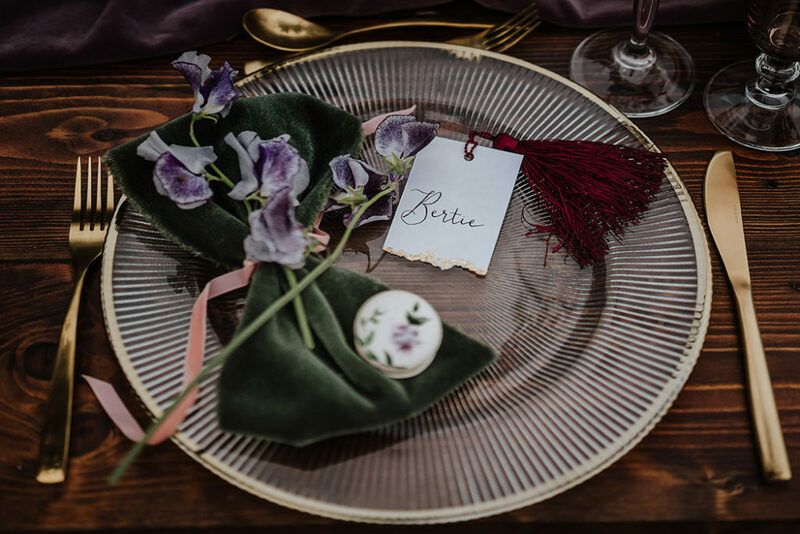 Ripped edge place names with gold leaf and tassels mirrored the glass wear and chargers. 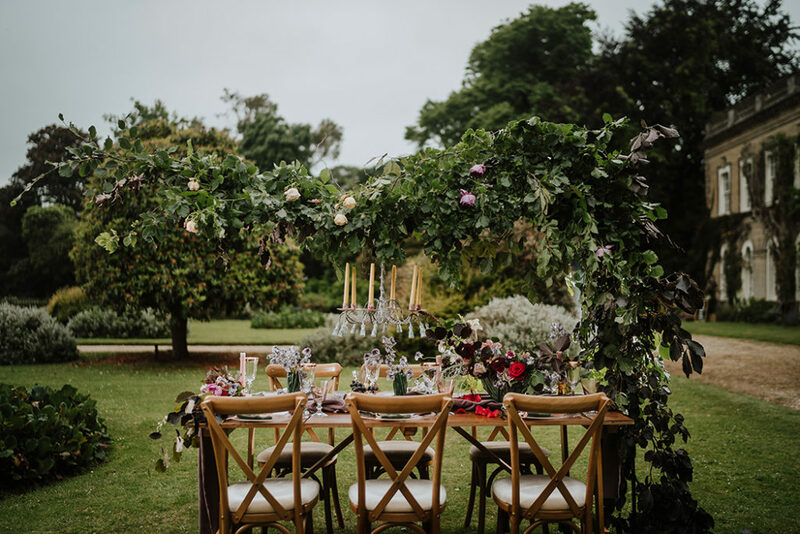 Flying foliage and British garden roses was the perfect canopy for this quirky, classically eccentric English garden. 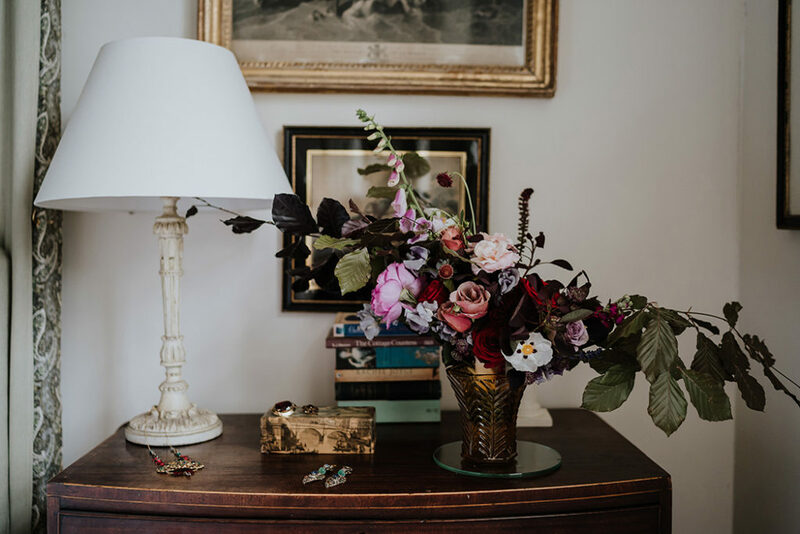 Loose arrangements and simple vases of British sweet pea, natural bees wax candles in vintage glass candle sticks finished off the look. 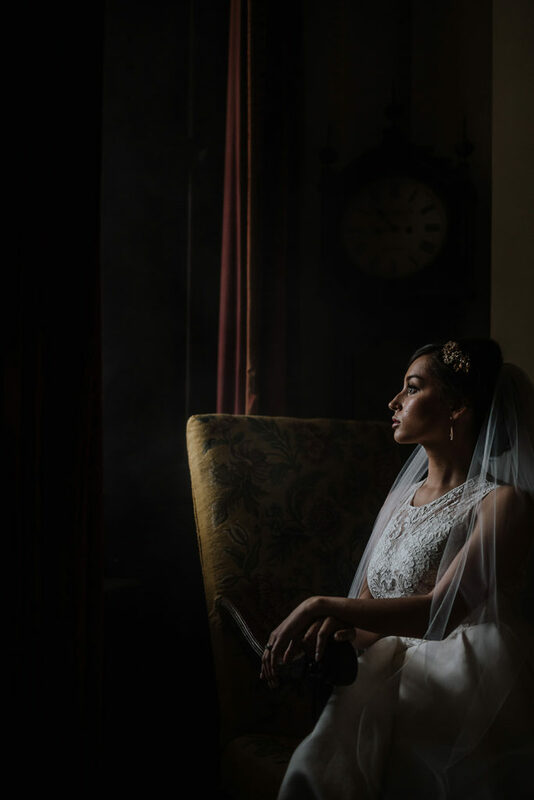 Last but no means least, the icing on the cake was literally magical and extraordinary. 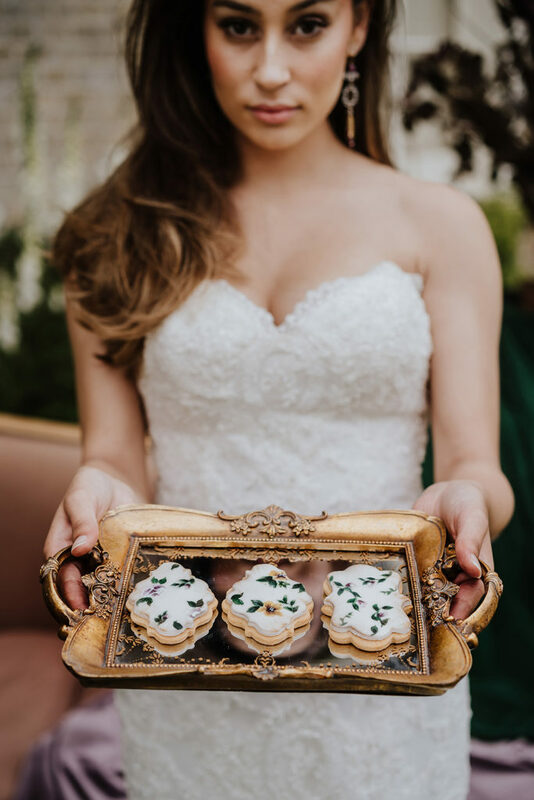 Hand painted, every detail perfect, beautifully paired with similarly hand painted macaron favours to compliment the sweetest of treats. 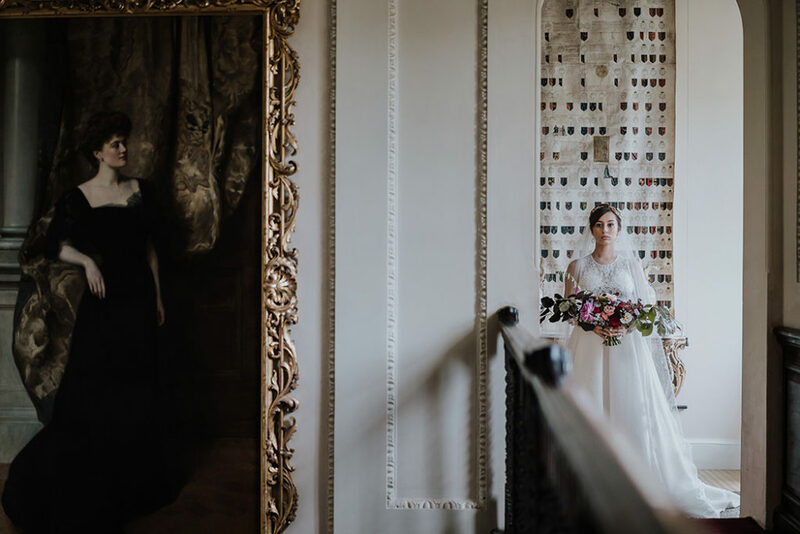 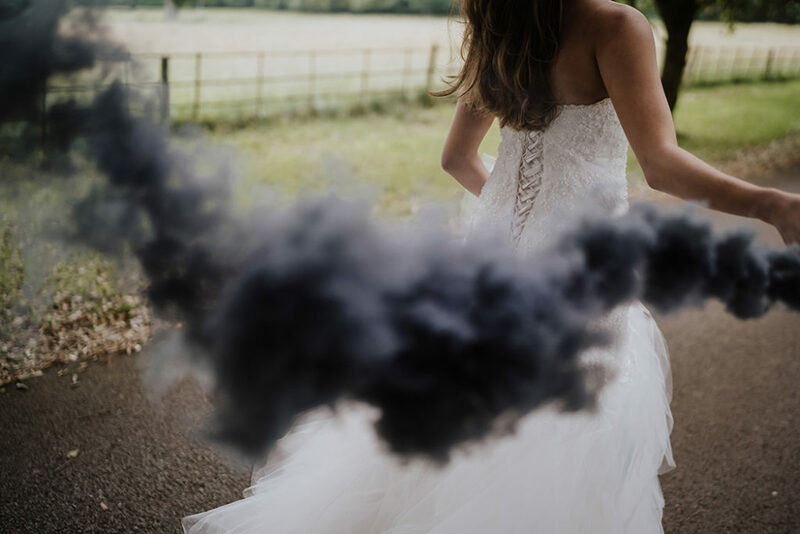 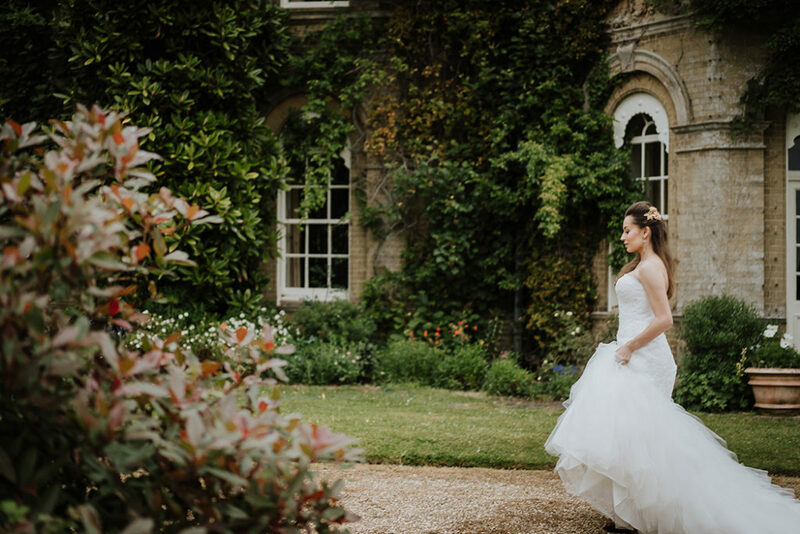 It’s a pleasure to be able to share these images with you – they are a result of a fabulous collaboration between a magical photographer, an exciting new venue and some incredibly dedicated and professional suppliers. 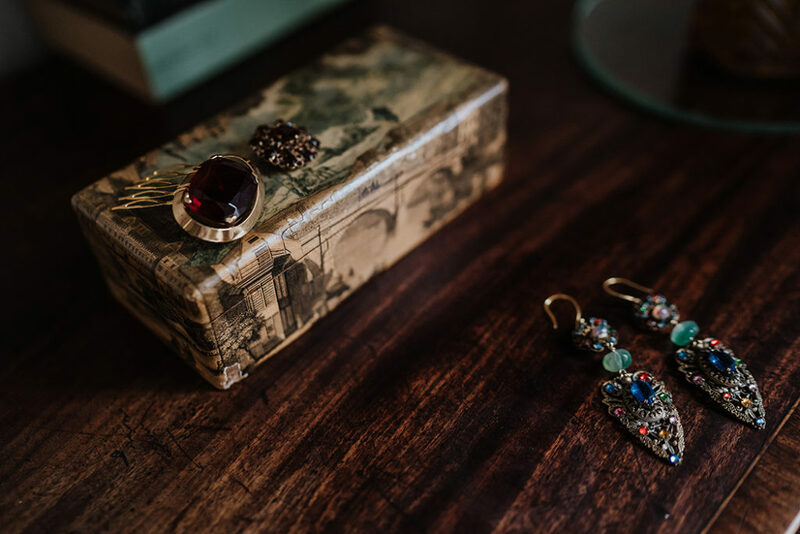 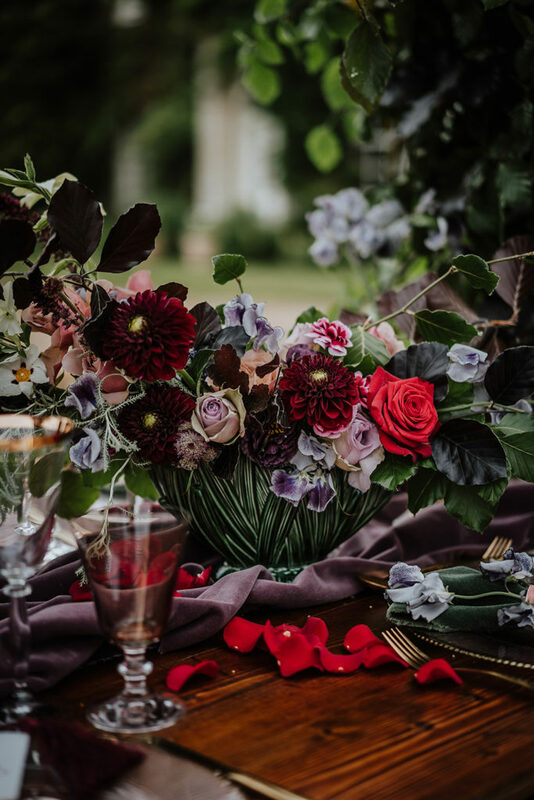 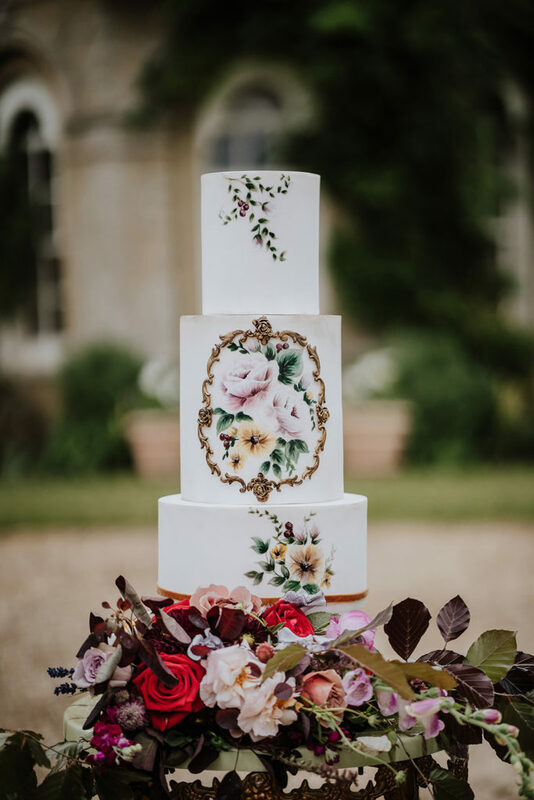 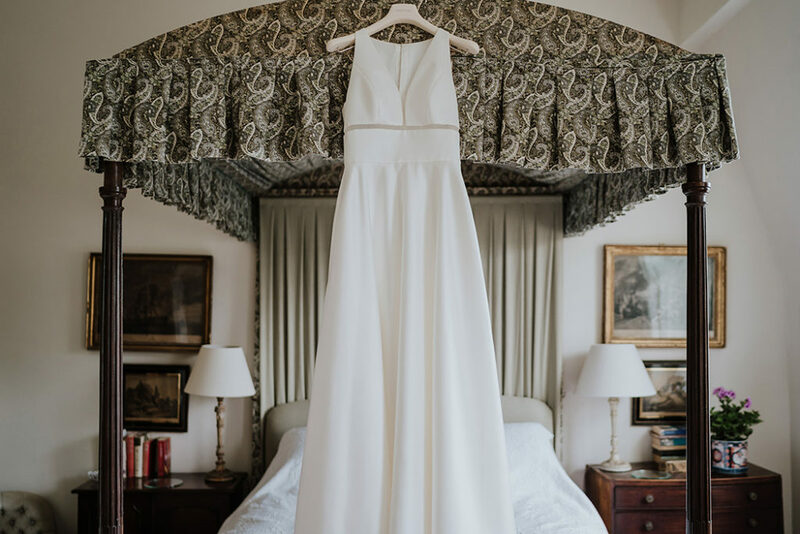 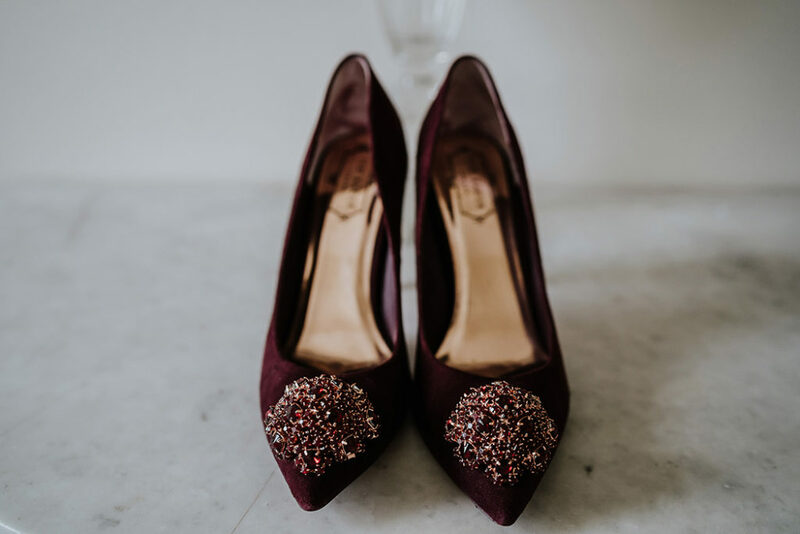 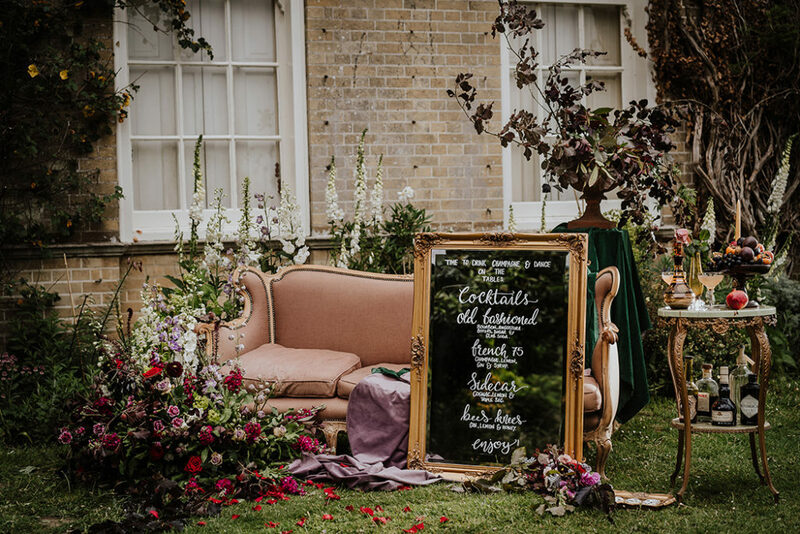 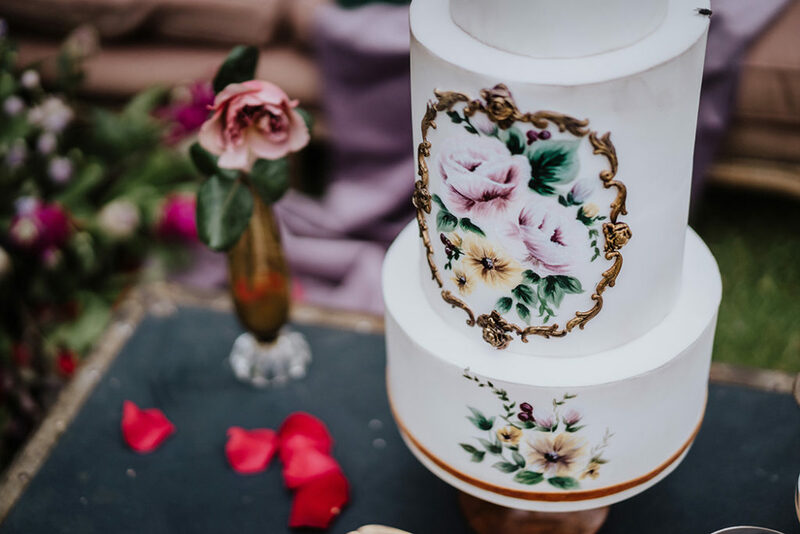 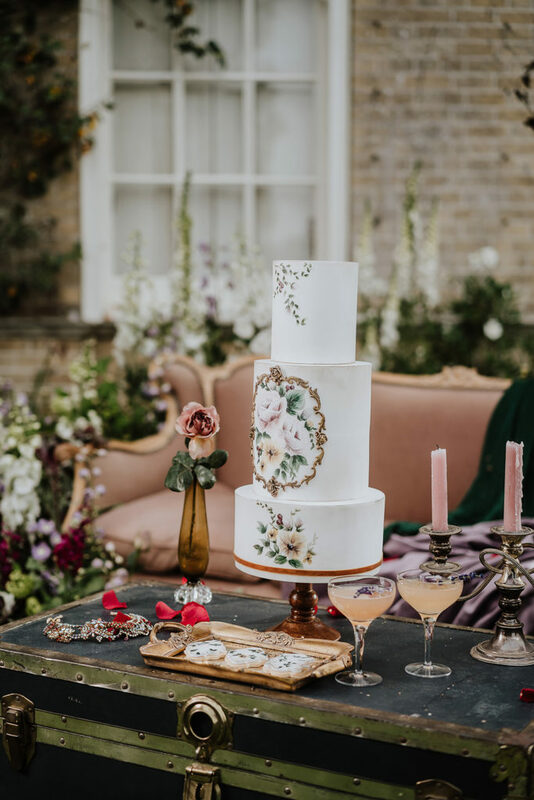 They offer a beautiful, opulent and incredibly elegant example of how to incorporate an eclectic, yet quintessential English wedding.